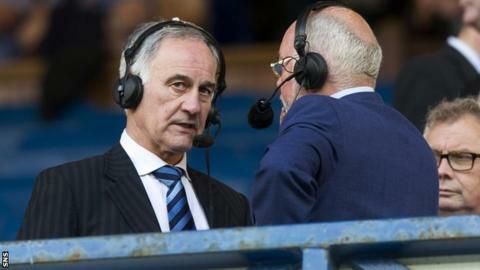 Rangers chief executive Charles Green has been charged with bringing the game into disrepute with his comments about a Scottish Premier League commission. The three-man body chaired by Lord Nimmo Smith is investigating allegations that Rangers' former owners used dual contracts to reward players. But Green told BBC Alba that he would challenge the charge he called into question the commission's integrity. The Scottish Football Association hearing is scheduled for 4 October. Green is being accused of suggesting in a media interview that the outcome of the commission investigating Employee Benefit Trust player payments from 2000-2011 and its sanctions had been pre-determined by the SPL. The compliance officer ruled that this broke disciplinary rules by bringing the game into disrepute and by not acting in the best interests of football. Rangers' chief executive has until 24 September to respond to the notice of complaint made by the SFA's compliance officer but has already challenged the charge on his club's website. "We made very clear in the statement that we made that we have never questioned the integrity of the panel," he said. "That is beyond reproach. "What I do have an issue with is the fact that the SPL has relentlessly been pursuing a fixed and predetermined agenda on EBTs from the moment they realised that they would not be able to get Rangers back into the SPL without a fan revolt. "Until that moment, the SPL were looking to trade SPL status for an admission of guilt on EBTs and a sanction of stripped titles. We couldn't and didn't give them that. "You need look no further than the initial draft of the five-way agreement. There is reference in that to EBTs and the outcome was stripping titles, but if I make a statement that the SPL is pursuing a predetermined outcome then I'm bringing the game into disrepute. "From the moment that SPL status for Rangers was off the agenda, we've been heading for stripped titles. "What I'm doing is using free speech to tell the fans exactly what has happened and I am now on disrepute charges for matters of fact. "The words that seem to have upset the SFA so much are that 'the SPL appoint the jury, set the outcome and set the punishment before the trial' - those things are true and I stand by them. "Whether or not the commission works to that agenda remains to be seen, but let's be clear there was a predetermined outcome. "If their chief Eexecutive and lawyers were drafting agreements that contained definitions of titles that would be stripped in late June/early July long before a commission was even thought about, how can anyone say they are not pursuing an agenda and a predetermined outcome? "I would ask the SFA and the SPL to release the first draft of the five-way agreement put together by their lawyers to reveal all of the sanctions. Stripping of titles was definitely within that document. "In terms of this commission, if the SPL agenda prevails then Rangers will be found guilty and being found guilty we will lose five titles." "What I said before is that this commission is not independent because the SPL have set it up. Saying that they are not independent is not saying that they are not impartial. "That's what I have an issue with and I will make these points when I go to see the SFA." Rangers refused to attend the commission's initial meeting last week, saying that the SPL no longer had jurisdiction over the club because they were denied membership of the top flight after the previous owners headed towards liquidation. The Ibrox club are now playing in Division Three of the Scottish Football League and Green said that any attempt by the SPL to take titles away from the club for the period during which EBTs were used would result in Rangers taking legal action. Former Rangers chairman Alastair Johnston followed up that statement by accusing the SPL of setting up a "kangaroo court" to "satisfy a self-serving agenda by vested interests in the SPL". Lord Nimmo Smith's commission decided to continue with its inquiry despite the club's boycott and hearing has been set for 13 November.